Jamal Sharif Anderson was born September 30, 1972 to Zenobia and James Anderson. Jamal had seven brothers and sisters. James was a former Newark policeman who worked as a bodyguard and security consultant for sports and entertainment figures. The family moved to Woodland Hills, California when Jamal was a young boy. Through his father he got to know celebrities like Muhammad Ali, Mike Tyson, Richard Pryor, Jim Brown and Michael Jackson. Bright and confident, Jamal seemed right at home in this glamorous world. Jamal attended El Camino Real High School and had a breakout year for the Conquistadors as a senior. He won All-State honors as a running back. His classroom work was somewhat less outstanding, meaning he would have to continue his football career at a junior college. Jamal spent the next two years playing for the Moorpark College football team, and showed enough to earn a scholarship to the University of Utah. He also entertained offers from USC , UCLA and Arizona. He chose Utah because the school demanded its players keep up their grades. Jamal played two seasons for the Utes, and as a senior he gained 958 yards and scored 11 touchdowns to earn all Western Athletic Conference honors. In the Freedom Bowl against USC, he gained 133 yards. Jamal did not possess the breakaway speed pro teams look for, however he had a low center of gravity and great quickness for a man who stood less than 6 feet tall but tipped the scales at 230 pounds. He used his forearm as a sledgehammer, shedding tackles and dishing out considerable pain as he plowed through enemy defenses. The Atlanta Falcons believed Jamal had the makings of a productive player and they selected him in the seventh round of the 1994 NFL Draft. The team’s main running backs at the time were Craig “Ironhead” Heyward and Eric Pegram. Jamal saw action as a kick returner before winning the starting job in 1996. 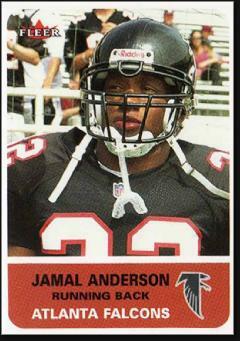 Jamal gained more than 1,000 yards in 1996 and 1997, as the once-woeful Falcons steadily improved. Whenever Jamal scored a touchdown, he would flap his imaginary wings in a celebration dance. The Dirty Bird would soon catch on and become a team celebration. In 1998, Atlanta went 14–2 and Jamal rushed for 1,846 yards and caught 27 passes for another 319 yards, and scored a total of 16 touchdowns. His 410 carries were the most in pro football history, and his rushing yardage was tops in the NFC and second only to Terrell Davis of the Broncos, who had 2,008. Jamal was named First Team All-Pro and picked to play in the Pro Bowl for the first and only time in his career. With Jamal tearing up defenses and quarterback Chris Chandler having his best year as a passer, the Falcons entered the playoffs with high hopes. In their opening game, Jamal scored a pair of touchdowns against the 49ers to give Atlanta a 14–0 lead. The Falcons held on to win 20–18. In the NFC title game, Atlanta faced the heavily favored Vikings. Jamal opened the scoring with a short touchdown reception, and the defense controlled Minnesota’s high-powered offense throughout the game. After 60 minutes, was knotted 27–27. The Falcons won the game on an overtime field goal by Morten Andersen. Jamal had 23 carries and caught 6 passes for a total of 100 yards. The Falcons faced Denver in the Super Bowl. After taking a 3–0 lead in the first quarter, Atlanta allowed 17 straight points and trailed 17–6 at halftime. After a scoreless third quarter, the Broncos scored two more touchdowns and ended up winning the game 34–19. Jamal had a good game, with 96 yards on 18 carries. Jamal injured his knee two games into the 1999 season and did not return to the field until 2000. That year he broke the 1,000-yard mark for the fourth time, but Atlanta managed only four victories. In 2001, Jamal suffered a career-ending injury in the third game of the season. Jamal amassed 5,336 rushing yards in his career, which covered 88 games (but only 64 starts). He scored a total of 41 touchdowns on the ground and through the air, and also threw for a touchdown in a 1997 game. After football, Jamal turned to broadcasting, working as an analyst for ESPN and CNN.